A great way to stay fit in the Spring! 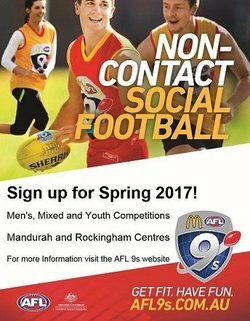 Visit the AFL 9's website for more information. 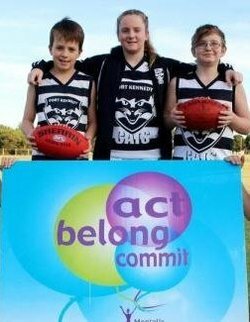 Port Kennedy Cats Junior Football Club is once again hosting an Act Belong Commit event this Sunday to engage both players and their families. THUNDER SCHOOL HOLIDAY CLINIC BACK IN JULY! 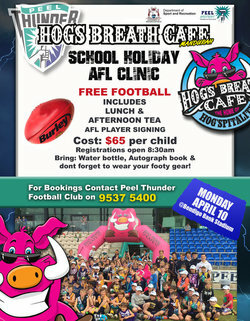 The hiughly successfuly Peel Thunder School Holiday clinic is back in the July School Holidays! 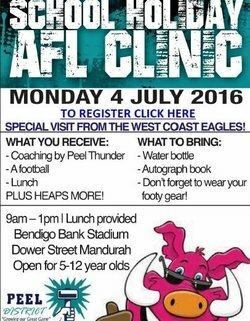 The kids will be treated to a special visit again from some of the West Coast Eagles superstars. Numbers are limited so get in quick and register! 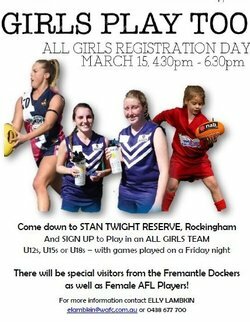 The peel district will hold an ALL GIRLS registration afternoon on the 15th of March at Stan Twight Reserve in Rockingham. The aim of the afternoon is to engage local girls and encourage them to sign up to their local teams. 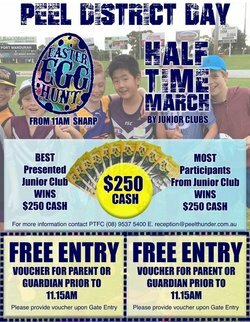 Special guests will be present inculdeing some of the Fremantle Dockers, AFL Womens players and Peel Thunderbirds representatives. 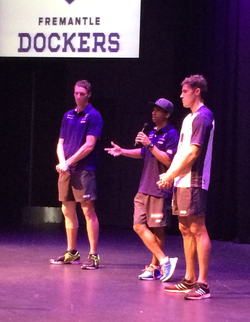 Fremantle Dockers wrapped up their two day AFL Community Camp on Tuesday after the players covering more than 1000km. 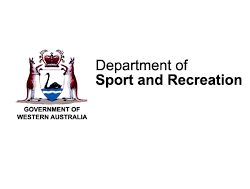 In recognising that grassroots football and the community are the lifeblood of Australia’s Game, the 2016 Australia Post AFL Community Camps had a renewed focus on school visits while also undertaking AFL super clinics and training sessions in the community and for local coaches.